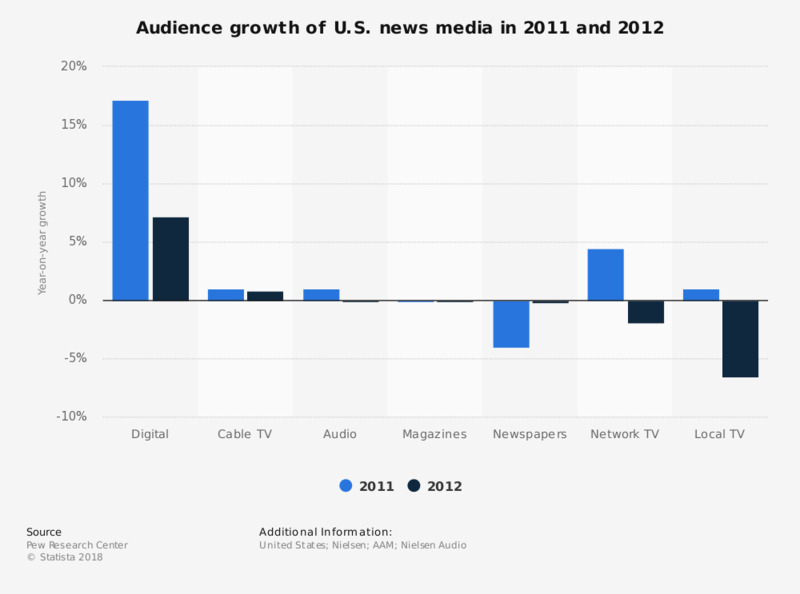 The statistic shows the growth of news media audience in the United States in 2011 and 2012. Online news media increased their user numbers by 17.2 percent in 2011. In 2012, the growth slowed down to 7.2 percent. The only other medium to report positive growth in 2012 was cable television. Network TV defines broadcasting chains in the U.S. with a main channel, supplying a small number of local stations with material. The growth for 2011 come from an earlier edition of the same publication. Spread of fake news during the 2016 presidential election in the U.S.
Statistics on "Fake news in the U.S."
How much do you rely on national news to stay informed? How much do you rely on local news to stay informed? How important is the source of a news story when determining if a news story is credible? What percentage of the news that you see on television, in newspapers or hear on the radio do you think is biased? To what extent do you trust the information you receive through these channels? Which of the following influences your final decision when voting for/about local community political candidates and issues? Which is your favourite source of entertainment? What is your main source of news about current events in the U.S. and around the world?